I. Will. Not. Keep. Silent. Isaiah says. It will not be possible to make me shut up. I will talk and not stop talking, proclaim and not stop proclaiming, preach and not stop preaching. I will shake the skies with my voice. I will not pause. I will not rest, until the the light from our nation shines like the dawn. Until everyone – nations and peoples, queens and kings recognize that truly God is alive among us. And that light will be the light of justice and peace. Sounds a lot like Jesus. Sounds a lot like Martin Luther King, Jr.
Every year we come up on Martin Luther King’s birthday. We get a day off of work or school, or we just have the inconvenience of having no mail service and no banking hours. Do we pause? Does it change our week, or our life? 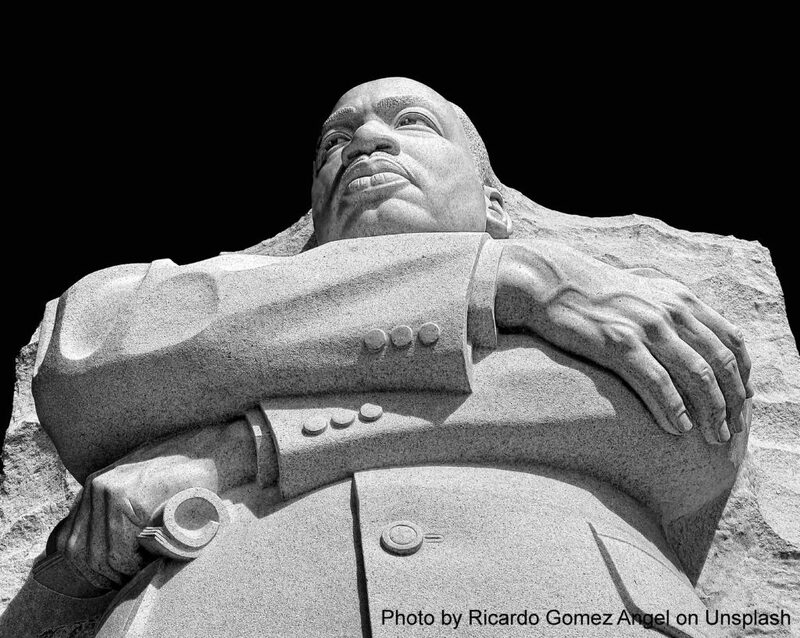 What does Martin Luther King have to do with a day off? With changing my schedule and juggling extra stuff? We pause to tell the story. Again. Again. Again. The same could be observed about going to church on Sundays. Over the three year cycle of lectionary readings and the holidays of the liturgical calendar, we come to the same stories over and over again. Why? Some stories are just that important. We need to hear them over and over again, until we can sway with the rhythm of the telling. These stories are so central to who we are that we must tell them, over and over and over again. It is true in families, too. Do you have stories of your family that you retell all the time? Some of those stories explain who we are. When my mother died, my siblings and I wondered together about whether we would continue to be a family. Would we continue to gather? Why? We had fallen into a rhythm of our common connection with Mom, but was there anything else? We are so different and live quite far apart. So we explored our family legacy. Over the course of about a year, we discovered that we do indeed have a family legacy, a story which holds us together. We found it as we began telling our life stories to each other. What connected us was the way we were all involved in doing new kinds of work with churches, particularly, reaching out to those who do not naturally have a place. And so, the great family stories began to emerge. Grandpa taking care of the farms of his Japanese neighbors while they were interred during WW2. The other Grandpa’s incredible joy in generosity. Our parents’ leadership in a mission chapel, serving youth and adults who were outside of our farmer culture and at the bottom of society’s pyramid. How the family stories impacted each of us differs, but they were the same stories. As we told the stories, we began to know who we are. We have a kinship of ideals as well as of blood. This is why we have a day set aside to remember Martin Luther King, Jr. Once a year. For Jesus we get every week. Martin Luther King was someone who showed us in our own times what the prophetic life looks like, what it might have been like to have John the Baptist preaching on the city streets. How to live the way of Jesus. It is good for us to take time to tell his story, read or watch his speeches. Does his faithfulness to the Jesus Way stand the test of re-telling, the test of time? Or is his message now irrelevant? I believe that King still speaks to today. We have not solved our racial barriers. People of color continue to be jailed more, are given less access to medical care and education, and are more likely to be poor. Our social and legal systems continue to separate rather than bring together. Where is the dream of taking hands across the aisles? We are together in this humanity, even when we disagree. So we need to hear Martin Luther King’s dream again. And again. And again. Not because it was his alone. But it comes straight out of the Bible! Martin Luther King reminds us who we are. Sort of like my family stories remind me who I am. We are loved by God. We are forgiven. We are connected to each other. The way forward is through love and peace, not violence and power. King faced squarely this issue of violence and use of power. In his early ministry years, still in his 20’s, he knew that his passion for justice would put him and his family in harm’s way. So he studied self-defense, got a gun permit and had several weapons in his home. He was ready to use violence against those who would threaten his passion for justice. But he decided that he was wrong! In the late 50’s, some powerful mentors challenged him – Bayard Rustin, Leo Tolstoy, Mahatma Ghandi, Jesus’ Sermon on the Mount, and many others – challenged him to reconsider his inclusion of violent resistance. The way of Jesus always requires turning the other cheek, putting down our swords. King became convinced that any minister of the gospel, and seeker after justice should do the same. In the end, he knew it would cost him his life, but he still refused to take up power against power. We have another voice emerging today to remind us who we are – Brene Brown, a sociology researcher who got a big voice through her TED Talk on vulnerability. Brown is not (that I know of) marching in the streets or speaking in the legislature. She is inhabiting social media and publishing and making podcasts. And she, too, is saying we have to undo our tendency toward violence. It is not even in our human nature. She draws on her legacy in Christianity. It gives her a strong center. But it is her sociological research which drives the conversation. What she is discovering as she talks to thousands of people is that the way of nonviolence, vulnerability, humility are the kinds of things that make us human. Whole. Fully alive. Jesus said that, too! She has so much to teach. I want to touch on just one thing – one subtle way violence works in our world today. In doing some research on Love and Trust for the divorce recovery group, I came across a podcast by Brene Brown. In her discussion of trust, she gets to bravery, and speaking up for what is most human in us. (I will have a link to this podcast in my sermon on the website this afternoon. Click on it and listen. https://www.youtube.com/watch?v=A9FopgKyAfI). She says that all of the pogroms and genocides known to history have begun with the way we talk about each other. It turns out that we are hard-wired neuro-biologically not to hurt each other. It goes against our human nature to treat each other with violence. We are wired that way to protect the species. We are a social species. We need each other. We are completely dependent upon each other. So when we begin to hate or resent, we have to re-program ourselves so that we can eliminate the enemy. It is a process called “dehumanization.” It is so subtle. It primarily uses words and images, nothing more…. Listen to Brene from her book, Braving the Wilderness. I warn you that some of her language will make you uncomfortable, and I have gentled it. What is happening in our country right now – those in power and the resistance – are slowly allowing ourselves to use dehumanizing language about people with whom we disagree…. When we use dehumanizing language, it says much more about us than about the people we are railing against and it chips away at our soul…. This is something we CAN stop doing ourselves and inviting others to do the same. It is a relatively easy first step. All we have to do is to monitor our own language. Do we always speak about people with respect, whether they are present or not? But DO have conversations. Brown suggests that if all we did was to sit down and have conversations about Black Lives Matter, listening to the stories without calling names and labeling, we could change the world in 24 hours, change the world toward peace. So…., do not be quiet, but do not call names. Be like Isaiah, Jesus, Martin Luther King, Brene Brown, and so many in the long history of prophetic voices calling us to be who we are meant to be. Who call us to live into our humanity. Like Isaiah, “I. Will. Not. Keep. Silent.” And remember to pay attention to the stories you tell and the words you use. It matters. This we learn from Brene Brown. This we learn from Martin Luther King Jr. This we learn from Jesus.